Reader's Digest/Taste of Home, 9781617655500, 638pp. 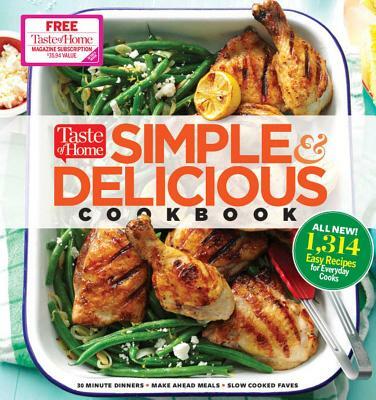 From Taste of Home, this exciting new cookbook follows Simple & Delicious magazine by offering page after page of family-pleasing foods you can make in 30 minutes, 15 minutes--even 5 minutes From quick weeknight dinners and on-the-go lunches to fun classroom snacks and special holiday treats, these favorite bites are guaranteed to please any day of the week. With 20 big chapters to choose from, busy cooks can quickly locate exactly the kinds of recipes they need. Five helpful recipe icons--Eat Smart, Fast Fix, 5 Ingredient, Slow Cooker and Freeze It--make it even easier to choose just the right dishes. CHAPTERS Snacks, Apps & Beverages, Finished in 15, 30 Dinners in 30, On the Stovetop, Slow Cooking, Oven Entrees, Quick Casseroles, Fast Comfort Food, Sides & Salads, Breads Made Easy, Good Mornings, Lunch on the Go, Buy This, Make That, Cook Once, Eat Twice, Make-Ahead Magic, Potluck Perfect, Sweet Treats, Desserts In a Dash, Party Time , and Holiday Highlights.